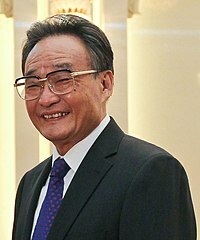 Wu Bangguo (Chinese: 吴邦国; born 12 July 1941) is a retired Chinese politician. He also was the Chairman of the Standing Committee of the National People's Congress, China's top legislative body from 2003 to 2013. This page was last changed on 10 January 2019, at 17:37.